Vic Law plays suffocating defense. The junior forward and the Wildcats opened their season with a tight victory over Loyola Maryland. ROSEMONT — Northwestern is 1-0, barely. Returning to the court for the first time since making history — and the NCAA Tournament — a season ago, the No. 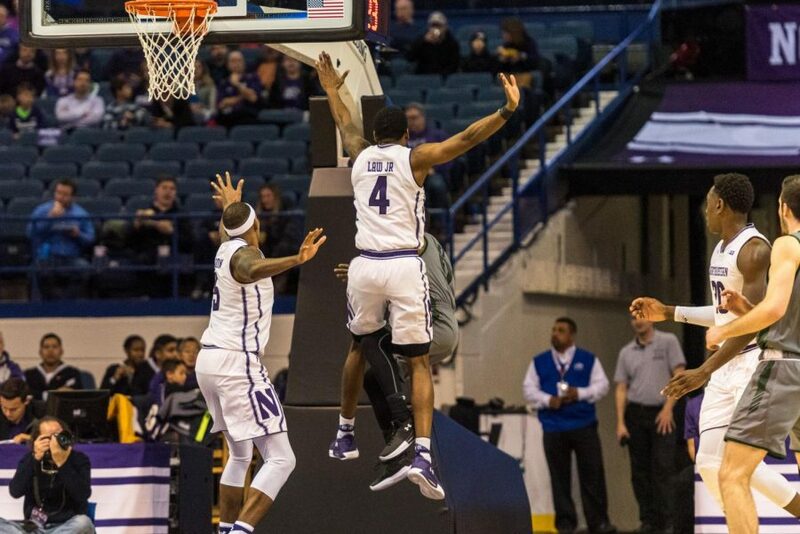 19 Wildcats (1-0) fended off a late-game challenge from Loyola Maryland (0-1) to secure a 79-75 victory Friday in NU’s first home game at Allstate Arena. NU led by 17 at one point early in the second half, but the Greyhounds clawed their way back to tie the game at 55 and took several brief leads in the final six minutes. But the Cats, despite getting stuck in the mud offensively after the break, made enough plays down the stretch — including two defensive stands in the final minute up by 2 — to eke out the victory. Senior guard Scottie Lindsey was NU’s catalyst on both sides of halftime, pouring in 26 points to lead all scorers. Three other Cats — senior guard Bryant McIntosh, junior forward Vic Law and junior center Dererk Pardon — joined him in double figures. 1. The Wildcats have some kinks to work out. It was not a flawless season-opening performance for NU. The Cats committed a traveling violation before scoring, Pardon traveled again and senior forward Gavin Skelly fouled a 3-point shooter, all in the first half. NU then saw its massive lead disappear in a matter of minutes, put Loyola in the bonus early in the second half after a series of sloppy fouls and had some ugly offensive possessions in crunch time. The Cats face St. Peter’s on Monday, but truly tough tests begin Wednesday against Creighton. 2. Scottie Lindsey is picking up where he left off. The senior guard, who averaged 14.1 points per game last season, fought off a gimpy ankle to approach his career high of 31. He hit 3-pointers on consecutive possessions in the midst of NU’s 16-0 run midway through the first half, then returned from the locker room to put an exclamation point on the opening period with a high-flying dunk. He was less dominant in the second half, but still made several big shots, including 3-pointers on consecutive possessions as the game hung in the balance. 3. Allstate Arena is no Welsh-Ryan. Lots of offseason talk revolved around how the Cats would fare playing home games several miles from campus. Early indications are that it will be a very different environment. A few dozen students filled one section behind the basket and fans throughout the arena made noise after Loyola drew level in the second half, but there were empty seats galore in the cavernous facility. Even as the 18,500-seat building starts to fill up in Big Ten play, it won’t have the intimacy of Welsh-Ryan.